Before we start milling away our stock we first need to get down to the required depth. This is not a problem with external features when we can plunge outside. 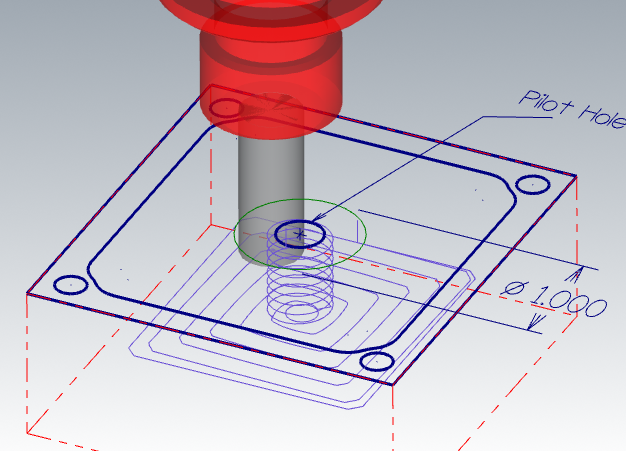 When machining closed pockets, however, we need to find a way to get down to the machining depth first. As usual there are several ways to get the job done. The plunging methods listed here are not ordered by their preference. For various machining operations on different materials some may be more preferable than others. This is one the best ones in my opinion. Very few machining modes can compete in effectiveness with drilling and this method will get you the best combined tool life on most materials and (in case of many deep pockets) the least machining time, even when tool change time is factored in. 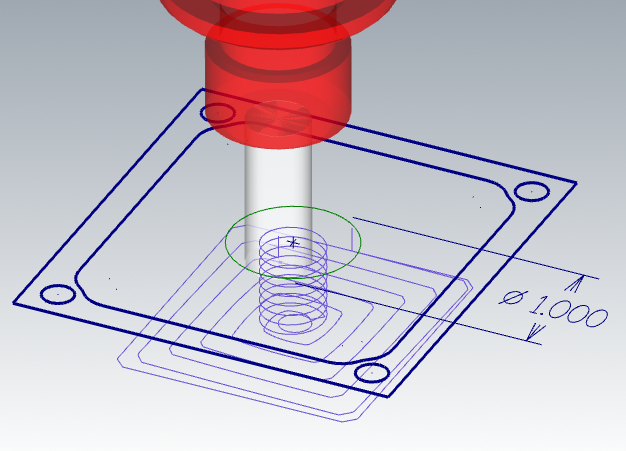 When using a pre-drilled hole technique, though, you should keep in mind that holes tend to collect chips and I would recommend machinists to make sure the holes are clear before plunging in. This can easily be done with an air blast or a through-spindle coolant. Most CAM software allow you to specify a drilling operation for a pilot hole. 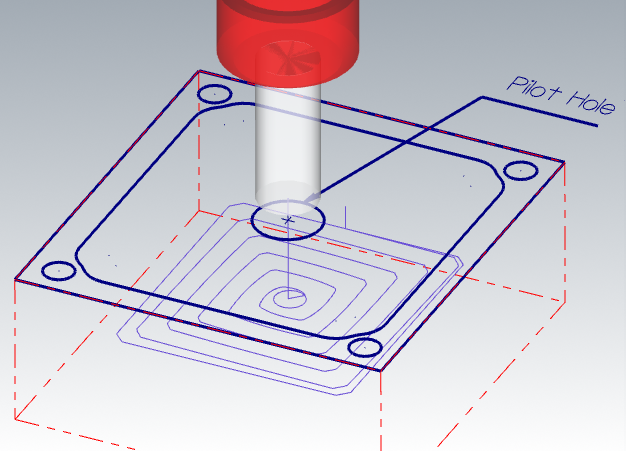 With MasterCAM's Dynamic Toolpaths, for example, I would normally create a hole geometry where I want the pilot to be and use it as "Air Region" when chaining my ToolPath, this would ensure my milling tool uses the hole region for plunging without the need for ramping. On aluminums, soft non-ferrous and non-metals this method gives best productivity and tool life. It also requires just one cutting tool for both plunging and milling. A few conditions have to be met for this method to be successful. First of all your end mill is supposed to be designed for straight plunging. In other words it needs to be center-cutting. 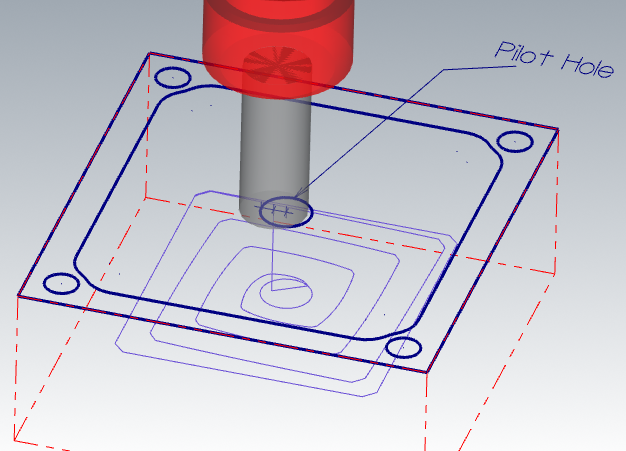 Ideally the depth of your plunge should not exceed one diameter of the end mill. When calculating spindle speed, I recommend using 70% of normal slotting cutting speed for this material and the feedrate should be divided by the number the End Mill's flutes. HSMAdvisor by default suggests plunging Speed and Feed according to these guidelines. To avoid having chips wrap around your tool you can use pecking or chip-break motion to break the chips. In such a case 1/4 to 1/8 diameter pecks usually help. When milling plunging into steels and other tougher materials, or when chip welding becomes an issue it is possible to straight-plunge into a smaller pre-drilled hole. Yes, this method requires a separate drilling tool to make the pilot hole, but, unlike the previous one, it will let you use non-center-cutting tools and improve the chip evacuation. This method plays well when you have to make a counter-bore on a hole, that you had to make anyway. Alternatively You can also use pecking motion to break the chips. On most mild materials this method gives good tool life and productivity. Not always we can find a drill larger than the diameter of the End Mill. In this case we can drill a smaller hole and helical-plunge into it at more aggressive feed and speed rates than we otherwise would ramping into the solid stock. This method works for tougher materials when it is impossible to to straight-plunge, or when chip-welding is an issue. Helical Ramping is a lot like straight line ramping, it also requires slower cutting speeds and feeds, but unlike linear ramping it requires circular motion of the cutter and can be subject to pocket geometry constraints. 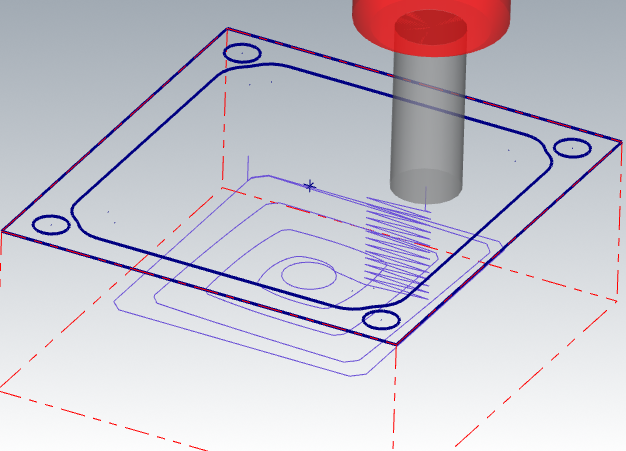 It is suggested to use 0.9 to .95 of the cutter diameter for the diameter of the helical path (resulting hole almost 2x dia of the end mill) and sometimes it is hard to fit such a large hole in a pocket. This method is my least favorite but because it is so easy to use, I often default to this one, as it requires the least amount of thought. Ramping is also the only method that will work when milling hardened steels. Unless you have a large carbide drill to put a pilot hole, of course. Any Full-width ramping method requires much slower cutting speeds and feeds than normal milling would. Since in this scenario the End Mill effectively has 360 degree engagement with the work-piece, cutting speed needs to be reduced in order to not damage the cutting edges. By the way HSMAdvisor considers not only the plunging mode when suggesting speeds and feeds, but also ramping angle. It outputs separate plunging parameters on the "Speeds and Feeds" panel. The pro of this method is better chip clearance when making long linear ramping motion and the con of this method is that often long linear ramping moves are not possible due to pocket geometry constraints. As previously mentioned, almost any case of plunging requires cutting speeds and feeds different than those for regular milling. When HSMAdvisor is used to calculate plunging speeds and feeds, it will automatically adjust speeds and feeds according to the entered conditions.